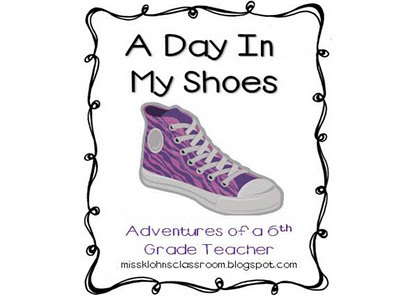 We figured there's nothing like taking a leap into the Bloggy World like joining a linky party, so here we go..
We're linking up with Adventures of a 6th Grade Teacher to show what a day is like in our shoes. 6:10am- Alarm goes off. Hit Snooze. Check Facebook on my phone to keep from falling back asleep. 6:20am- Literally roll out of bed. 6:20-7:15am- Do all that "getting ready"stuff. 7:45am- Arrive at school. Students won't get here till 8:15...I like at least a half hour before they arrive. Otherwise, I feel rushed. 8:15am-Kids come rolling in, check the SMART Board for the Morning Message and get to work. For the next 15-20 minutes I'm going through HW Folders, taking lunch count, and doing attendance on the computer. 8:40am- Morning Meeting. We do at least a greeting every morning. 8:45-9:10am- Writing. We're working on Free Choice Pieces right now. I usually do a mini-lesson and send them off to write for about 10-15 minutes. 9:15-10:10am- Reading. We use Storytown. I have been extremely lucky to find files online that a teacher made for the SMART Board, and that takes us through our whole Reading Block. 10:15-10:45am- Our version of the Daily 5. Students make 2 choices per day. After doing the Daily 5 this year, I would never go back to regular centers again. 11:40-11:50- Bathroom Breaks. Students work on unfinished work, flashcards, or a D5 choice during this time. 11:50-12:20- Social Sciences. We're finishing up our "Me on the Map" unit. 12:25-1:45- Math. Math can be a frustrating point of the day for me. It's hard when I feel like my students just don't get it. Despite so much work with the Number Grid, there are a few kiddos who still aren't getting the concept. 1:45-2:05- Stack'n'Pack (got that term from Cara Carroll ) We've got this pretty much down to a science...but, boy, oh boy, did this take foreverrrrrr at the beginning of the year! 2:55-3:10- Dismiss class. We are a walking district. This means many of my kiddos get picked up by parents...very few are walking home this time of year. 3:10-4:30- Meet up with Jenna, and our other grade partner, Erica, to talk, vent, or plan, and get a few things done in my room. I rarely leave school before 4:30. 4:30-10:00- Get things done around the house, spend quality time with Pinterest, and oh, my fiancee and Mac(cat) and Georgie (dog), eat dinner, pack lunch for next day, and hit the sack. There ya go! Nothing too fancy. Jenna's days are usually more interesting than mine! 6:20-7:15 "get ready!" I typically pick my outfit out the night before but somehow I rarely ever manage to wear the outfit I pick! 7:25 if I haven't gotten the Starbucks coffee text from Halle by now, it's not coming! I pour myself an extra large cup of coffee, grab my lunch and gym clothes, and head out to conquer the day! 7:33 Arrive at school, usually carrying 4 bags and nearly falling over..get myself ready for the day and go talk to Halle about our plans to Enhance the minds of second grade! 8:15- Hereee they come!!! The students come in and read the morning message and get started on morning work. They check the board for any intentional mistakes I have made. 8:20- In walks "girlfriend"... With no breakfast or some crazy issue ( Girlfriend is one of my favorites, shes a teeny tiny little thing who drives me nuts, but makes me laugh harder than most adults I know) We get her some breakfast or handle our issue and we're movin on with our day. lately. After our greeting we usually play a game or head back to our seats for sparkle! 8:40-9:10- Writing! We are working on similes for our class book and they are hysterical! Some are still completing our heart maps. We are going to start story grabbers next week. 9:10-10:01- After a few minor disruptions ang "gf" outbursts.. We are continuing on! Story town time! I'm not as fortunate as Halle to have a Smart Board, so it's white board time! We review our skills for the week, robust vocab, story, and ocean words. 10:01-10:50- Now that it's January, we've stopped with the infamous "Is it almost lunch time?" We do centers, our version of the Daily 5! We LOVE this!!!! 11:40-12:26-Prep time! Usually running around like a nut figuring things out! 12:26-1:45- dun dun dunnnn... Math time! Like Halle previously stated, math is no walk in the park for us! I actually had a little cutie of mine cry today because she didn't know her facts. It's terribly frustrating because we can't quite figure out what they don't get? I'm hoping ( fingers crossed) this gets easier!!! 1:45-2:06 - We also do a version of Mrs. Carroll's.. We do stack,pack and snack! After we go over homework and we're all stickered, we're allowed to pack and get our snack. 2:06-2:55 Social Sciences time! We are finishing up our "Me on a Map" unit. Some of my little guys didn't know the name of our state! Scary, I know. At this time my 3 inclusion kids are back in my room so we have a full house! 2:55-3:02- Chair up/Line up (unless there is homework club in my room) We begin our trek to the exit where we wait for the parents to come get us. Like Halle said, we're a walking district, some days I'll be waiting for parents til 3:15! 3:15- Meet with Halle and our other grade partner, Erica. We spend some much neede time together venting and assessing our day! 3:45 - ?? Well many days I stay at school til 6. I usually stay til 4:45... Go to boxing at 5 so I can get home and see my hunnie! I still live home, but Ant and I have been looking at houses lately. I'm hoping for a definite soon! Between both of us working 2 jobs ( our 2nd jobs are exact opposite hours), my boxing schedule, his travel schedule, and me consistently doing school work...I don't get to spend much time with him. Needless to say, we're ready to move out! For now, my "me" nights are spent on the couch with Kaimana, watching Criminal Minds or Hawaii 5-0 and grading! I'll keep you posted on the house hunt! Welcome to the new blog on the block. We're Halle and Jenna, friends, grade-partners, confidants, and sounding boards to each other (and that's just summing it up!) 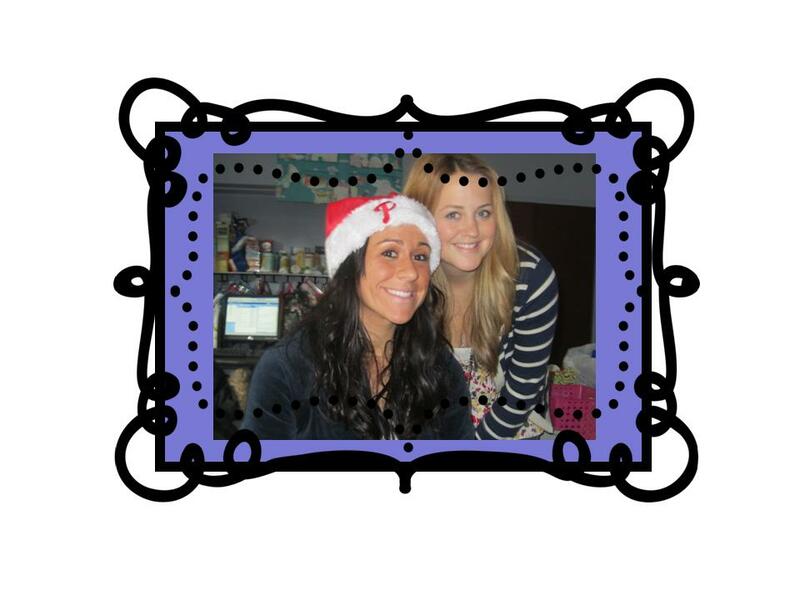 After stalking so many of those awesome blogs out there, we decided to take a leap of faith and make one of our own. This is my fourth year as an elementary teacher, and my second year as a 2nd grade teacher. During my first two years teaching, I taught 3rd grade. As much as I loved my 3rd graders, I consider myself to be lucky to have been moved to 2nd grade last year. 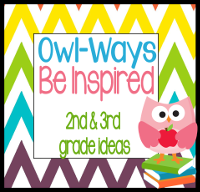 Something about 2nd grade and I just clicks! When I'm not busy with school (which is a rarity! ), I love spending time with my fiancee Dave, our cat Mac, and our sweet, sweet, Bichon-mix, Georgie. Seriously, this dog is my obsession! I spend my winter months holed up in our house (which thanks to Pinterest is looking better and better everyday), drinking Starbucks (Pumpkin Spice Lattes), stalking blogs (teacher and otherwise), and planning our August 2012 wedding, and longing for summer. I love 2nd grade for so many reasons, but two of them being my grade partners, Jenna and Erica. They keep me sane. They make me laugh. They make me a better teacher, and they certainly help take some of that teaching stress away! This is my first full year teaching second grade. Last year I long term subbed in second grade and absolutely fell in love. Prior to superb second grade, I taught 5th and 6th grade in the gorgeous state of Hawaii. It was an unbelievable experience that has changed my life forever! Coming home wasn't easy, but when you have a big Italian family and the most adorable grandparents in the world, it was impossible to stay. Hawaii has become the object of my obsession! I think I know more about it than I know about New Jersey. The culture and history of the islands fascinates me and always kept me wondering. When I'm not teaching, or living in my classroom, I enjoy many things. I mostly enjoy spending time with my family and my handsome boyfriend Anthony. I am in love with my shiba inu/corgi mix Kaimana. He was named after my favorite Hawaiian student and his name means "strong water." Interesting enough, Mana HATES water, taking baths are not easy! I love surfing, boxing and running. I have a shopping addiction, doesn't matter what store I'm in... I can always find something I want to buy! I have been bartending for 3 years now and continue to do it one night a week. I don't love it like I used to, but I have some interesting stories from it. Matt Damon said it best, teachers don't teach for the money, they teach cause they love what they do! That explains my reason for still working job #2! It makes me laugh because my second graders have better manners than most of my customers! I absolutely love teaching 2nd grade! It's nice to have the kids appreciate all your hard work. Lucky for me I have two fantastic grade partners who have helped make my second grade experience extremely pleasant! Halle has been an amazing mentor and guide for me. She started helping me last year and right then and there I knew I would be blessed to have her as a grade partner again !